Dozens of teenagers were forced to publicly beg forgiveness from their parents while their parents were scolded after the youths were caught using drugs at an after-hours pub. Banglamung District officials led the raid on the JT Pub & Karaoke on Soi Khopai around 3:30 a.m. July 23. More than 150 customers were inside, with 70 of them found to be underage. Seven of those were younger than age 16. Of the underage teens, 30 tested positive for drugs – 15 for ketamine, seven for crystal methamphetamine and eight for marijuana. Another five adults also failed urine tests. Club manager Praewprao McCulloch was arrested and charged with violating opening hours, selling alcohol after hours, allowing underage people to enter, selling alcohol to underage customers, and allowing drugs to be used. 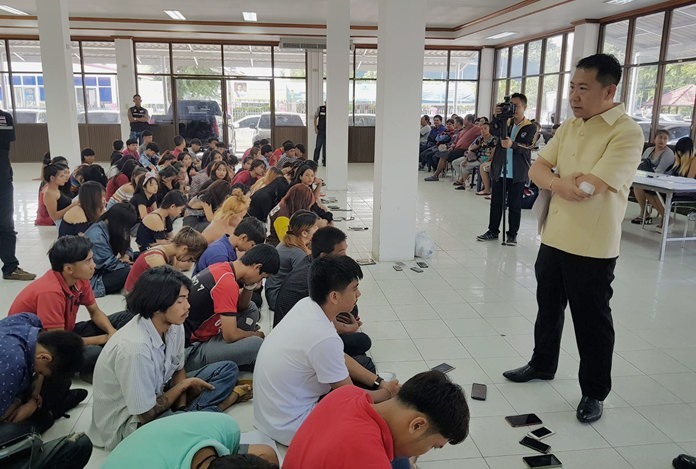 The teens and their parents, however, were ordered to appear later the same day at the Banglamung District office where military officers and district chief read both the riot act – the kids for using drugs and staying out until the wee hours, and the parents for doing such a poor job of parenting. After they apologized for humiliating their parents and besmirching the image of Pattaya, the teens were packed off to a drug-rehabilitation camp and parents given a warning to better supervise their offspring. The pub, meanwhile, faces a five-year closure.